Expression of hTAU-P301L causes abnormalities in neuronal morphology and behavior. (A–G) Whole-mount immunostainings for znp1, which labels synaptotagmin in the extending axons of primary motoneurons. Expression of TAU causes a dramatically reduced extension of znp1-positive motoneurons already at 28 hpf (A and B). The difference in motoneuron length is quantified (C) by measuring the length of the first 4 znp1-stained motoneuron projections (marked 1, 2, 3, 4 in A and B) before the end of the yolk extension (marked by dotted line). Triangles and diamonds represent values from individual motoneurons; colored horizontal lines represent mean ± SD. ***P < 0.01. 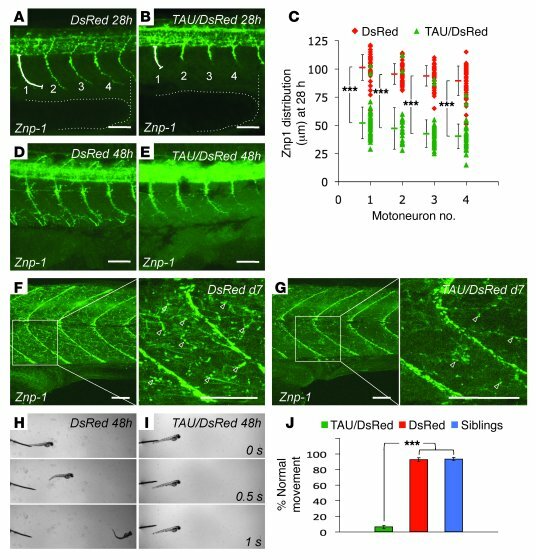 In 48-hour-old embryos, the motoneurons have grown further in both TAU fish and controls, but the motoneuron extensions are still reduced (D and E). 5 days later, the motoneurons have grown around the muscle in both TAU fish and controls (F and G). The fine projections of motoneurons (see enlarged insets, arrowheads), are still highly reduced in TAU transgenic fish. Lateral views of the trunk above the end of the yolk extension, anterior to the left. Scale bars: 50 μm. (H–J) The stereotypic escape response, which is normal in DsRed-expressing (H) and nontransgenic larvae at 48 hpf (data not shown), is highly reduced or absent in TAU-expressing larvae (I; see also Supplemental Video 2). The phenotype was quantified in groups of 50 TAU/DsRed versus DsRed transgenic larvae, which were pooled from several clutches and selected for strong and comparable DsRed expression (J). Error bars represent mean ± SD; ***P < 0.01.